How to Create REST API using Node.js, Express.js, Mongoose.js and MongoDB with an easy and effective way. Before we begin, make sure you have installed all tools that required. In this tutorial, we will work using Terminal and Atom as the text editor. For Windows user, you can work using Node.js command line. 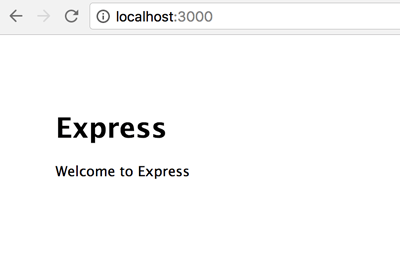 We started this Node.js, Express.js, Mongoose.js and MongoDB tutorial from scratch and then continue a quicker way using Node-Restful library. Let's begin. This will create Express.js project with the EJS view instead of Jade view template because using '-e' parameter. Next, go to newly created project folder then install node modules. Run the server by this command. You will see the log like this in the terminal. Open your browser then pointing to 'localhost:3000', if you see like the image below then your server is ready. Stop node by push CTRL+C on the keyboard. Type this command to install Mongoose.js module. Before running your server again, make sure MongoDB server is running. Open another terminal, then type this command to start MongoDB server. Now, open and edit app.js in the root of project folder using your favorite text editor or IDE. Declare mongoose in require sections. Use mongoose with native Node Promise. Next, run the node app again. You should see this message on the terminal. It's mean connection to MongoDB is successful. Open and edit Product.js file the add this lines of codes. That Schema will mapping to MongoDB collections called product. If you want to know more about Mongoose Schema Datatypes you can find it here. Our REST API that we build will have following functions. Open and edit routes/products.js then add this lines of codes. Next, open and edit app.js then add product route as require after users require. After everything is ready, this time to testing our created Node.js, Express.js, Mongoose.js and MongoDB REST API. There are so many tools for testing REST API, but for now, we are testing using CURL from the terminal. We start with Add/Save product data first. Open new terminal tab or windows the type this command. If you get the response like below, then you save new product successfully. We can create the same POST with different data to populate more record to product collection. Next, we are testing to get all products data using this command. That command will response products data with JSON format. Next, we are testing to get one product by id using this command. Next, we are editing and update one of a product by id using this command. First, copy id from one of product from the response before then paste it as the parameter. Finally, we are testing for delete one product by id using this command. It will response like this and product with that id will be removed from product collection. There are so many method and library for creating REST API quicker and elegant. One of them that I found is the Node-Restful library that you can find on Github. Just add the library using npm command. Open and edit app.js on the root of the project. Add require line for Node-Restful and Method-Override. Change "bodyParse extended" value to true then add this lines. Create mongoose model that use together with Node-Restful library. Right now we are creating "category" model. Run again the app and test it using previous way for testing REST API. You can compare with another framework that I write on this website. By the way, this the full source code on Github.